What's a Flight Officer? : Chair Force Auxiliary? Ladies and Gentleman, He's Back! 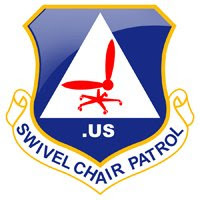 Tedda, creator of the sorely missed Civil Air Portal, and the now-defunct Flying Minuteman site has returned with his web-comic series Swivel Chair Patrol. A hilarious, yet good natured look at our beloved Civil Air Patrol, Tedda combines the wit and charm we have come to expect, with a little self-parody and scored a winner.